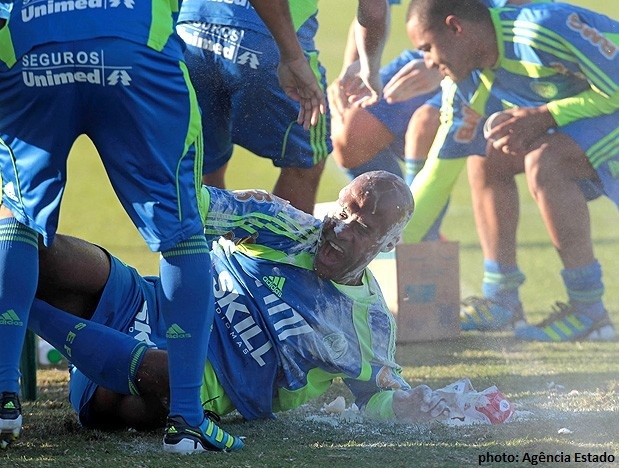 We’ve talked before about the way Palmeiras is able to create havoc all by themselves. 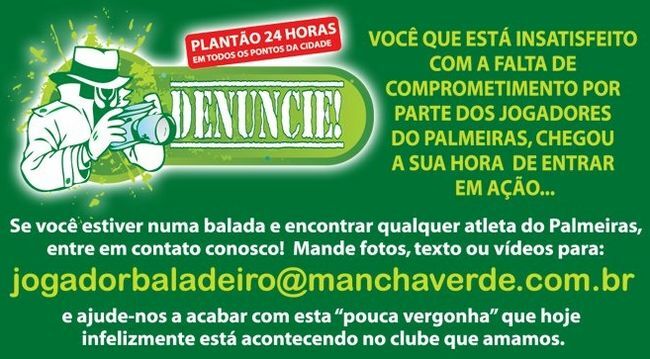 The latest addition is a surprisingly stupid initiative coming from the main supporter group Mancha Verde: the setting up of a “hotline” (actually, by e-mail) to which people are encouraged to contribute with text, pictures or videos of Palmeiras players enjoying themselves on their free time. Kleber, Valdivia and, for reasons unknown to me, Marcos Assunção seem to be the primary targets at the moment. Opinion: work is work and leisure is leisure. Felipão and his staff, including the people at the medics department and everybody else dealing with the players on a day-to-day basis, are all professionals with many years – hell no: decades – of experience. They will know what is expected of each player, they will know when he’s under-performing and possible causes for this. Let them do their job. A witch-hunt is not exactly what Palmeiras need to improve an already tricky player/supporter relationship. Speaking of Assunção: the set piece specialist turned 35 the other day. Tradition among footballers calls for flour and eggs a plenty. Anything Palmeiras wishes Assunção a Happy Birthday and that he may commemorate with a goal against Atlético Mineiro tomorrow Saturday! One thing pushes the other: the Atlético game is the next “ping” on our radar sonar of today. With the still uncertain destiny of Luan (most likely he returns to France after tomorrow’s game), Scolari is already trying out new constellations. Wellington Paulista has been training on the right flank and might prove the solution (I doubt it). Dinei and Chico have also been receiving more attention this week due to the suspensions of Kleber and Márcio Araújo (3rd bookings against Figueirense) and are likely substitutes. Palmeiras has not only been winning on but also off the pitch. A recent court decision stipulates a fine of little over US$ 21 million that Corinthians will have to pay Palmeiras for the transfer of right-winger Rogério, who left Palmeiras for the arch-rival in the year of 2000. An addition, Palmeiras are entitled to roughly US$ 4 million from the club Ituano for a similar case involving the striker Basílio. The Brazilian judiciary works extremely slowly, but at least in the right direction this time. When and how (even if) the fines will be paid is a different story. We’ll keep you updated. Finishing in style: today, pre-ordering of the São Marcos commemorative jersey kicked off! All white with golden details, this piece is a must have. Only a few close-up pictures of the jersey have been made available so far; as soon as there are more info we’ll update the blog with a thorough exposé. AVANTI PALESTRA!